This was another busy quilt, with a lot going on in the blocks (stars and large appliqued hearts) and in the border fabric. 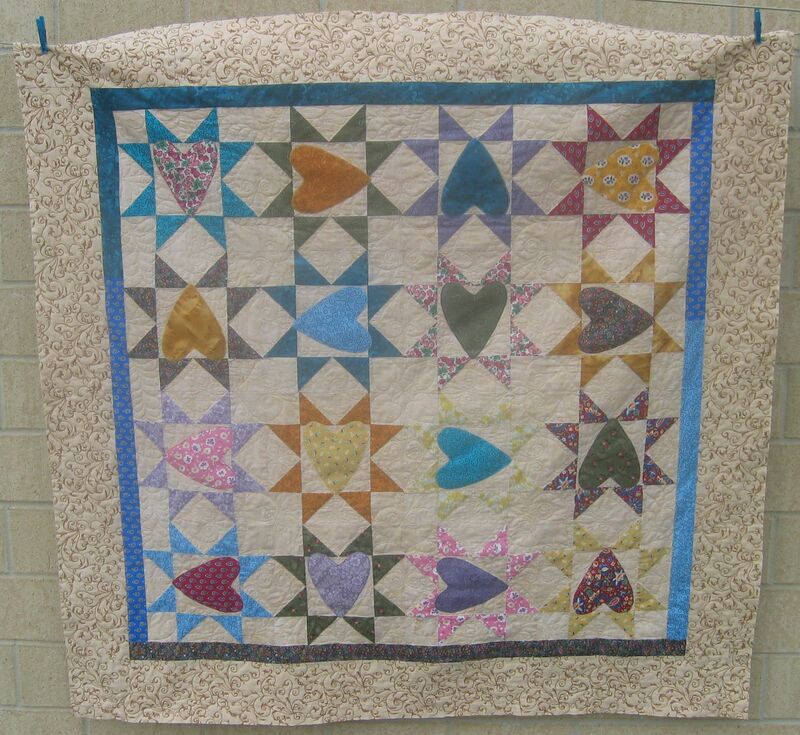 I decided to only quilt the ‘white space’ and leave the star points, the hearts, and the first border unquilted. 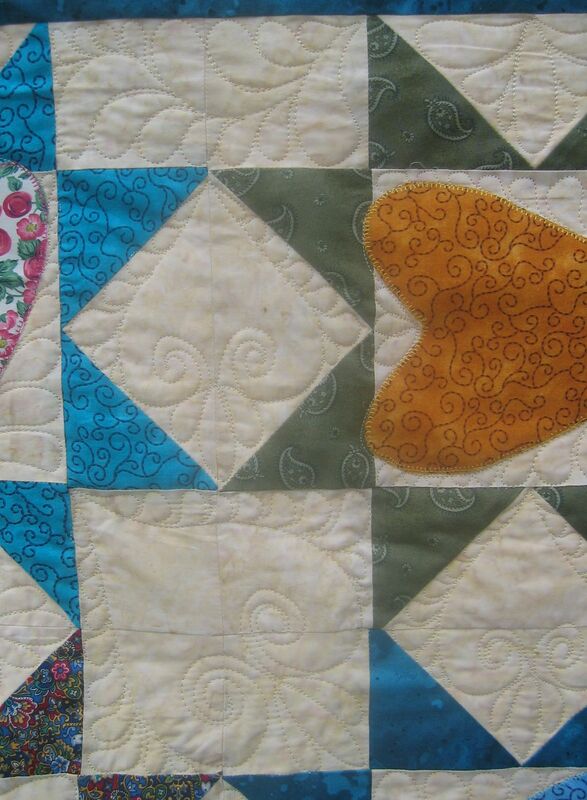 I started with the diamond shapes between the big stars, quilting a free motion heart (with curlicues) in each and finishing the hearts off with free motioned feathers. I did something similar in the large cream squares. 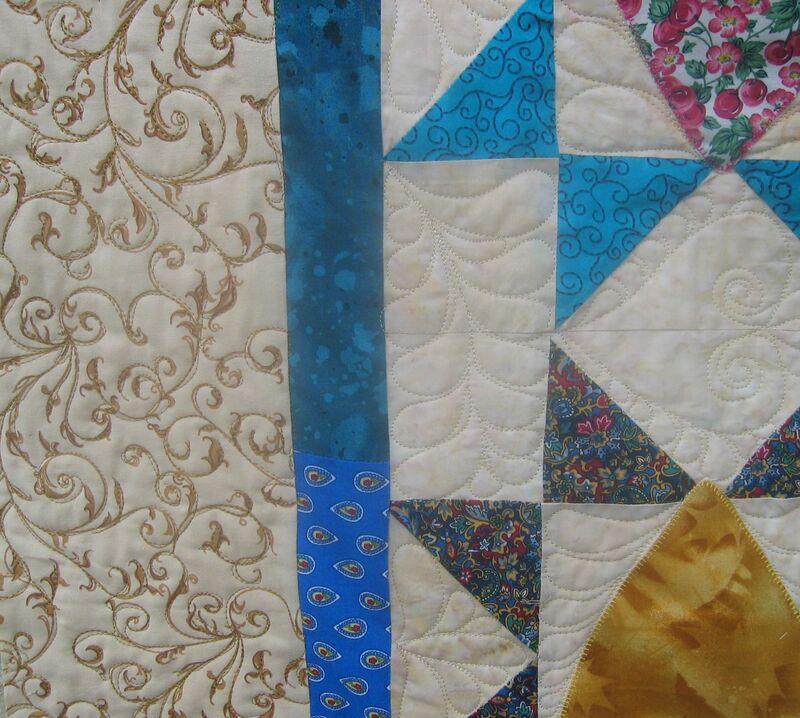 Next, I did the cream triangles along the blue border — also doing another featherlike motif. More feathers for the rectangular shapes along the blue border — I got the idea for how to quilt this odd shape from the ‘Create Your Own Dream Feathers’ book by Peggy Holt (thanks for this book, Glenys!). I then stitched feathers around each appliqued heart. 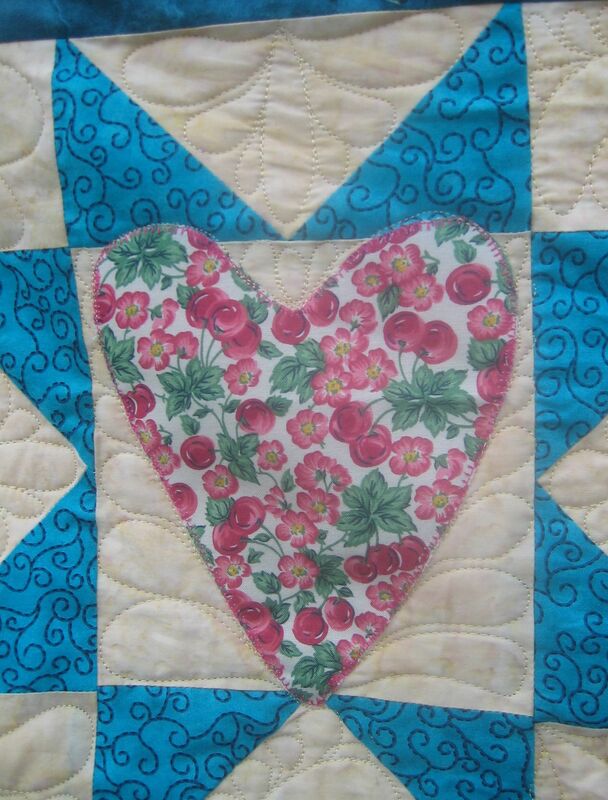 And stitched some plainish hearts in the very centre and the corner squares. Then the main part of the top was finished. For the border, I decided to just follow (in general terms!) the design motif of the fabric using a similar coloured thread. This fabric was already very busy and I thought that doing something equally as busy but using another different quilting motif was going to be overload in this area. I’m glad I stuck to my original decision, even though it took much longer to quilt than I expected — there must have been thousands of curlicues in that pattern! As an aside, I must be getting more confident in my quilting as I did all the quilting at 60-70% speed on my Handi Quilt Sweet Sixteen! That’s pretty fast! Hello, I found your blog about a month ago, and really enjoy it. 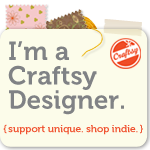 I love the way I can go in close a check out your quilting, it is really inspiring as I am just getting the hang of fmq. Thanks for the opportunity to share your quilting. Wow! You did such a nice job on this quilt. So much going on, makes it a bit of a challenge to sort out something that will do well with the piecing/applique work! Doing these has pushed you so far in such a brief period of time. Such fun, hmmmmm? all the quilting you do enhances these quilts, very clever!